The CDs are here, June's issue and Blogger's Challenge! What to talk about first? I don't know which I more excited about! I went out for a few hours this afternoon, and the CD fairy delivered the first shipment of the Stampbooking CDs! I will work on stuffing the mailers, labeling, and applying postage this evening so that they are all winging their way to the folks who pre-ordered their copies. 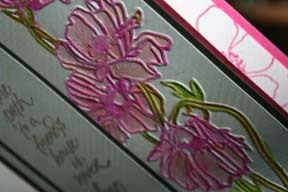 If you have not yet, you do order the Stampbooking: The Art of Using Rubber Stamps in your Scrapbooks HERE. The June issue of the Technique Junkie Newsletter was mailed yesterday, too, and the link to the issue is live. If you are a subscriber, you can access the online pages right now! Email me if you subscribe and need the password, or if you would LIKE to subscribe, do so HERE. 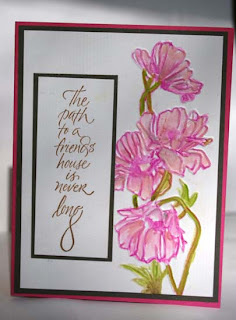 Finally, today is Blogger's Challenge Friday -- and it is about shimmer. My submission uses Glitter for my shimmer, and it is from a new technique from the June 2011 issue of the Technique Junkie Newsletter called Glitter Roll. In addition, the LIVE, LOVE, LAUGH words are from an embossing folder that uses the Cuttlebug Highlights Technique (From the Technique Junkie Newsletter Emboss or Die CD). You can, of course, play along with us on the BC Shimmer Challenge by adding your artwork to the hop list. And make sure you look at what the other ladies are doing, too! I hope you all have a wonderful Memorial Day weekend. This is the final week of sponsoring month of the Gingersnap Creations Blog. 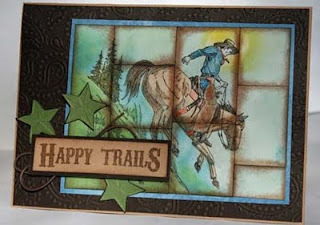 Our Cowboys and Cowgirls theme ends with the color theme of Denim, Dust and Rust -- and what better way to celebrate a fun month than to giveaway some terrific stamps? And of course, the card comes with it...featuring the Faux Denim Technique from the December 2007 issue of the Technique Junkie Newsletter. Make sure you visit the Gingersnap blog for more of the TJ Design Team artwork -- we had fun with this one! Entering this giveaway is simple. Leave a comment for me on this blog post with your name and email address, and my handy-dandy random number generator will select a winner on Tuesday, May 31st. Anyone can enter! Good luck! 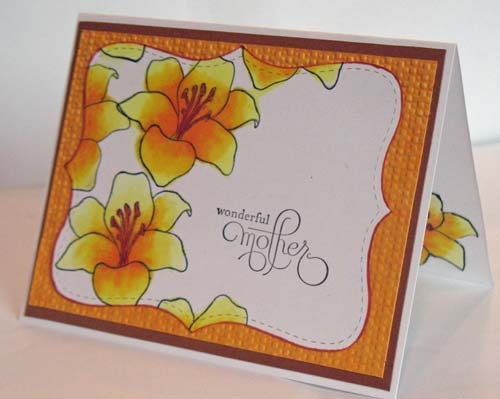 Congratulations to Becky Benson, the winner of this Stamp set and Card! This may be my favorite project on all of the CDs I have ever produced. These Grungy Altered Titles from new Technique Junkie Newsletter Stampbooking CD are so cool! The CD contains this tutorial, plus 75 other techniques showing you the art of using Rubber Stamps in your Scrapbooks. It is $17.95 for US/Canadian Residents, and $19.95 for Overseas addresses. I just heard from the CD printer they are on their way here today...I will be mailing them the same day that Fed Ex Ground delivers them. Shouldn't your CD be among the first mailed? Order yours HERE. 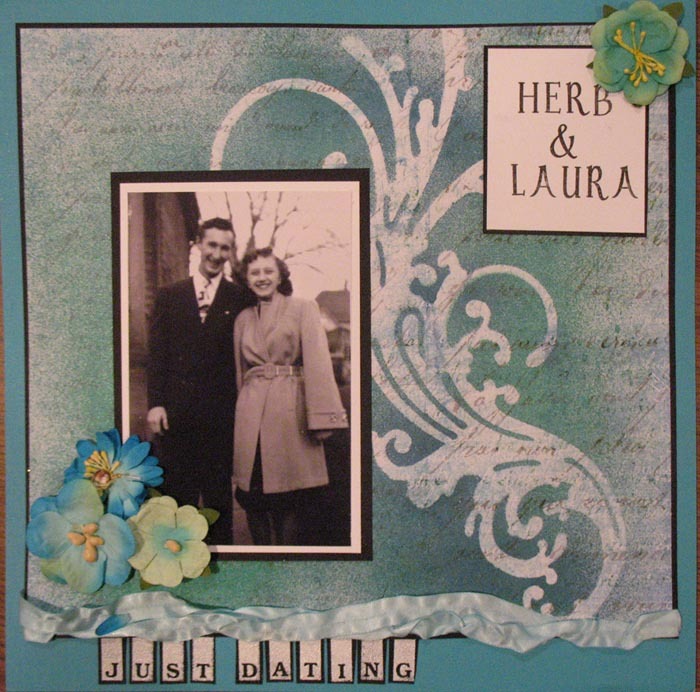 I just wanted to share another layout from the new Technique Junkie Newsletter Stampbooking CD. 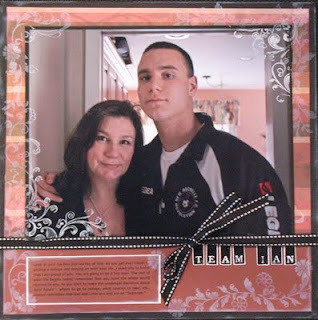 This is one of my favorite layouts-- doesn't he look happy just to be with his mom? Okay -- the CDs will be shipping in about two weeks. In order to have yours on time, you need to order in the next 3 or 4 days. The Stampbooking Cd is for everyone who needs or wants inspiration for stamping in their scrapbooks. There are a whopping 75 Tutorials on this CD -- all in step-by-step pictorial fashion -- easy to print and take with you to crops. They make it easy for you, too -- they include a supply list and a couple of finished layouts so that you can see how the technique was interpreted by others. It is a bargain for only $17.95 (US and Canada. Overseas: $19.95). Click HERE to order yours today! 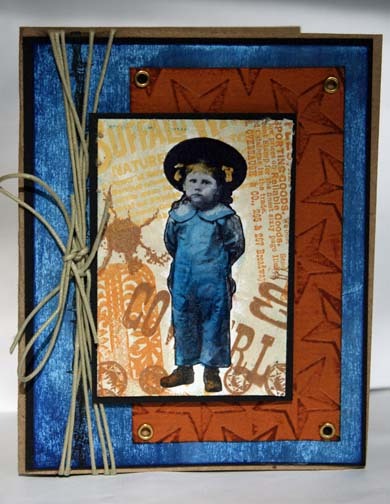 As you may know, the Technique Junkie Newsletter is the sponsor for the Gingersnap Creations Blog this month. Today's challenge was to make a card expressing Scenic Stamping. My interpretation of that is above. Of course, I had to morph my card -- I just thought it would look cool if I made it into a Aged Tile (April 2008 Technique Junkie Newsletter) card. 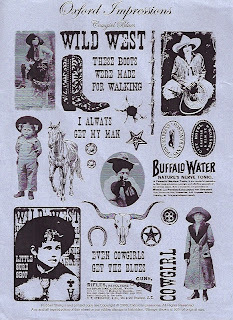 Stamps: Cowboy: from the Embossing Arts line at I Brake for Stamps, Sentiment, Club Scrap. 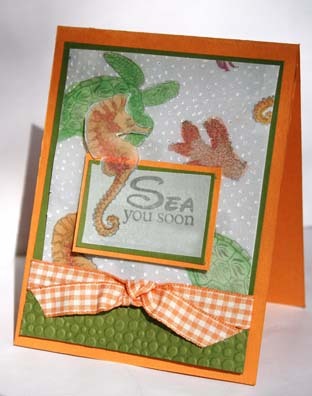 Stop over the the Gingersnap Creations blog today to see what others have created! One of the greatest things about the new Stampbooking CD is the ability browse through it to find inspiration for your layouts, then to print out the tutorial (with examples) to take to my scrapping area. I love having these 75 step-by-step ideas at my disposal! 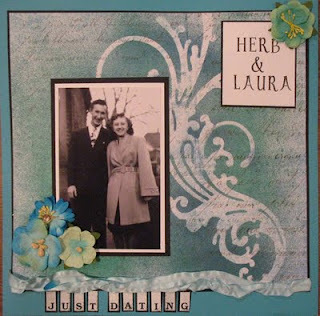 The fun part for me in creating this CD was trying as many of the techniques as I could before CD release -- and even now I am still working through them with my current scrapbook projects. This page was embellished with Flowers made from the Tie-Dye Chic Embellishment technique, one of the 18 Embellishment Tutorials you will find (out of the 75 Tutorials on the CD. 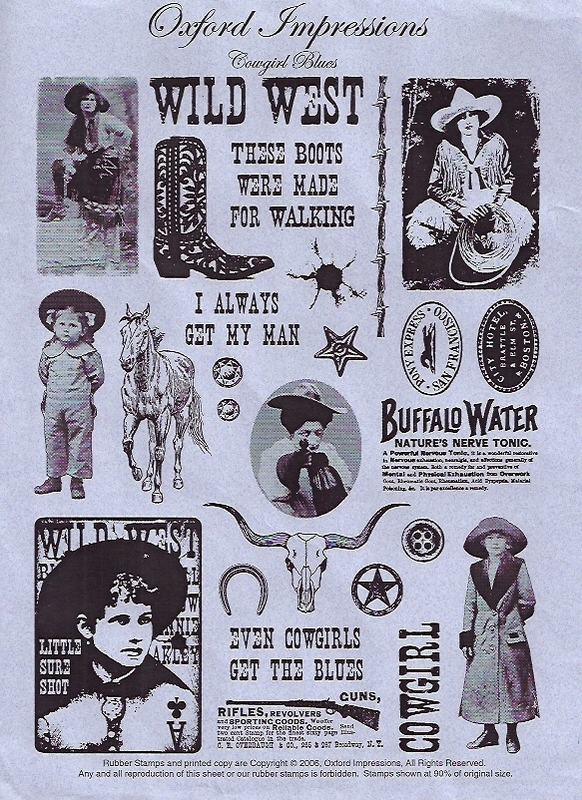 Stamps from Judikins and Close To My Heart. I think they add the right splash of color to what could have been a monotone layout. I am a Junkie for Techniques -- and for anything Parisian. 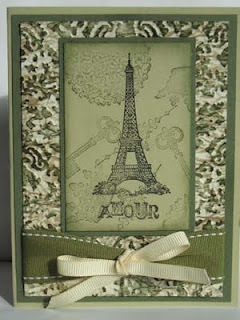 I love Eiffel Tower stamps -- I try not to buy them, but somehow I have several different sizes of them in my stash. This one is from Stampin' Up!. 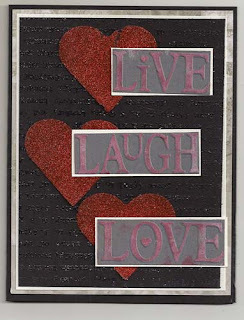 The card here uses the Faux Fresco Technique from the Emboss or Die CD for the background. It has great texture! I made this for a color challenge on a Yahoo group -- I needed to send this to my friend Rose, who is a unbelieveable stamp artist, so I was a bit nervous sending it to her. I hope she liked it! Have you heard about the Stampbooking CD? Have you heard? 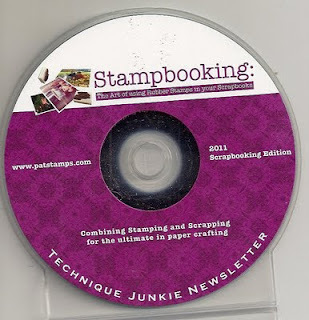 The Technique Junkie Newsletter is proud to announce the newest Specialty Technique CD: Stampbooking: the Art of Rubber Stamping in your Scrapbooks. This CD contains a whopping 75 tutorials, with several examples of stamped layouts for each technique. Each tutorial is in step-by-step, pictorial format, and is presented as pdfs, so you can print them and use them away from your computer! The page above is an example of one of the techniques on the CD. It is, by far, the most inspiring CD we have ever created! The CDs will be mailed the first week of June. Pre-order yours today! 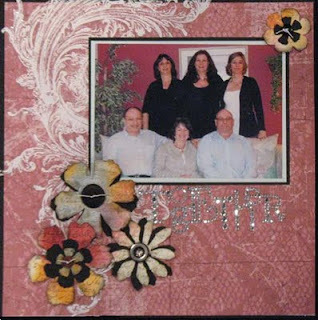 Click HERE to be taken directly to the Stampbooking order page, and to see the list of tutorials on the CD. Come Stampbook with us! Stamps used in layout above: Club Scrap, Stampin' Up!, Judikins. My mother passed away a little more almost exactly 5 1/2 years ago and I miss her greatly. She warmed the world with her smile... She was kind, and believed that you should never say anything bad about everyone. I miss her greatly, as do my five siblings and father; scores of cousins, aunts and uncles, along with her many friends. She brightened everyone's worlds. So this card is for you, Mom. You helped me become the mother I am; I have often looked to your words for dealing with my own children. I miss you horribly. Happy Mother's Day to everyone. And thank you to my children, who are so sweet and have worked so hard to make this a special day for me! The Stampbooking CD features a whopping 75 tutorials for using rubber stamps to create titles, borders, frames, albums, embellishments, and so much more. 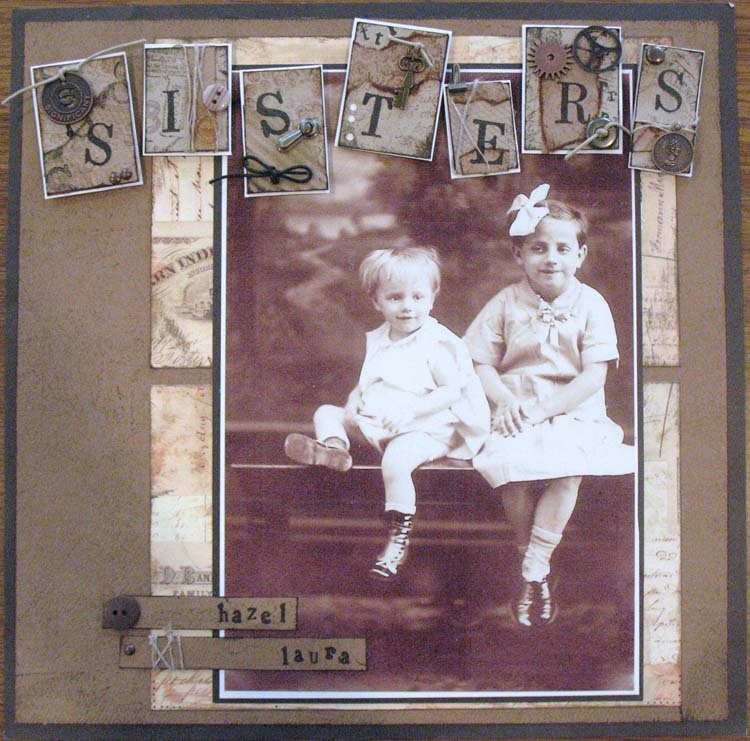 The CD is a collaboration between TJ Publisher/Owner Patricia Huntoon and TJ Design Team Member Jane Bosi, both seasoned Stampbookers. The 75 pdf tutorials on this CD are in step-by-step pictorial format -- easily printable to 8-1/2" x 11" paper. The CD works on both PCs and Macs with Adobe Reader. Each tutorial includes at least two examples of layouts using the technique. With over 150 Stampbooked pages on the CD, it is worth it just for the inspirational artwork! You can pre-order this CD right from here, or go to THIS PAGE to order from my site.Please note that all of the CDs will be mailed the first week of June. 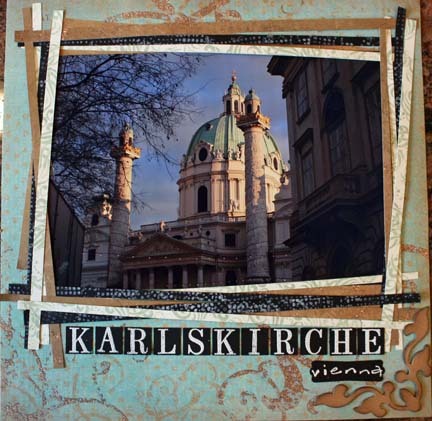 The example show above uses the Fancy Frames Technique from the CD. Stamps: Stampin' Up!, Penny Black, Printworks. Today's Blogger's Challenge was easy -- NATURE. We simply had to create something -- open to our own interpretation -- that represents nature. My take is this card using the Pierced Vellum Technique from the April 2011 issue of the Technique Junkie Newsletter, along with the out of the box technique from the October 2004 issue of the Newsletter. The gorgeous paper and the cute stamps are all from Mark's Finest Papers - and don't forget -- you can get 15% off anything at Mark's Finest Papers by using the code TJMAY15. Valid through 5-15-11. Feel free to join in the challenge today - simply enter your artwork using the links below. 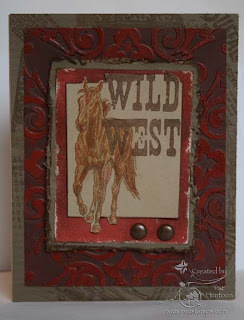 The month of May brings big things...first, the Technique Junkie Newsletter is sponsoring the Gingersnap Creations Cowgirls and Cowboys Challenge this month. If you have not frequented the blog, go take a look -- we are sponsoring prizes all month there! One of the items we are giving away is the Emboss or Die CD. 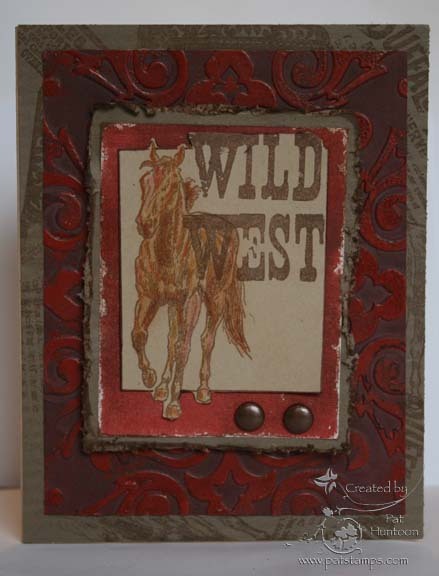 The card above uses the Faux Tooled Leather Technique from the CD. Other techniques used include the Out of the Box technique from October 2004 and the Torn Frames Technique from December 2008. Stamps from Oxford Impressions. The other Big Thing -- and this is a BIG THING -- is a new announcement I will be making on Saturday. 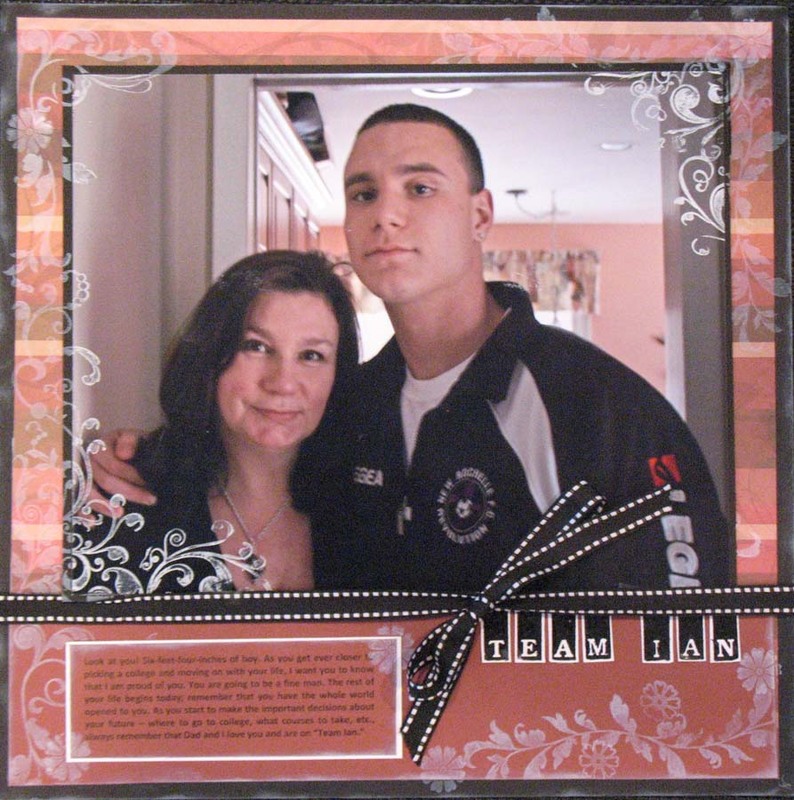 Let's just say that making this announcement on National Scrapbooking Day is not a coincidence! You may have noticed that I have been a bit MIA for a while -- especially these past few months. You will know why on Saturday! So Saddle up, partner! Take a look at the Gingersnap Creations blog (today features the work of some of the TJ designers!) and get ready for Saturday's big news.